Samsung Galaxy stores photos in the DCIM folder. The device creates the folder itself upon inserting a memory card or in the internal storage provided within the device. The chances of losing photos are high and for different reasons. Nonetheless, losing the data is a disaster. Fortunately, DCIM folder empty Samsung Galaxy recovery is possible using a recovery tool. Next, we will help you to find DCIM folder in Samsung Galaxy and recover deleted DCIM folder on Samsung Galaxy. For the question of how to find DCIM folder on Samsung Galaxy, there are two answers - using the "My Files" app and by connecting the device to a computer. Tapping the grid dots located at the bottom of the screen opens the applications available on the device. In the next screen, one can tap the "My Files" app. Finding the same application is possible in the Samsung folder. Upon selecting the option, the device will display both the internal storage as well as an external SD card (if present). If there is an SD card, the device creates the DCIM folder on the card. If there is none, the software generates the folder in the internal storage. Upon selecting the required storage location, the device opens a new window that displays all the folders available on the device. Scrolling the page will enable one to locate the DCIM folder. One can view the available files by tapping the DCIM folder. It is necessary to switch the software to the developer mode to connect Samsung Galaxy to a computer. One can perform this action by tapping the settings application on the device. The next step is to locate "About Phone" under the Settings page. Tap "Software information" feature and tap "Build number" seven times to switch to the developer mode. The software will display the pop-up. Return to the Settings page and choose "Developer options". In the new page, switch on the USB debugging by sliding the icon to the right. The option will enable the device to connect to a computer using the USB cable. One can further scroll the page down and click USB configuration. Under this option, the user will have to select the Media Transfer Protocol (MTP) option, as it allows them to browse the images present in the DCIM folder on the device using the computer. One can use a USB cable to establish a connection between a system and the Samsung Galaxy device. When Windows recognizes the phone, it will display a pop-up message asking what to do with the connected device. A user can select the option "View folder or files using File Explorer" option. Choosing it will open the files contained on the internal storage of the device. From the same, a user can select the DCIM folder to view the images present on the phone. iBeesoft Data Recovery is a reliable and safe retrievable tool that helps to recover DCIM folder Samsung Galaxy and its content in a few simple steps. It is possible due to the use of the advanced algorithm along with the deep scan technology, which scans the device thoroughly and displays all the lost files with ease. 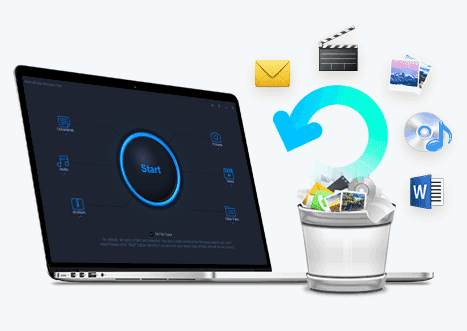 Recover all kinds of deleted or lost files, including photos, videos, music files, documents and more. Recover files from hard disk, lost partitions, external hard drive, SD card, USB drive, RAW drive etc. An advantage provided by the iBeesoft Data Recovery application is its ability to identify more than 1000 file formats and support several storage devices. The following steps will help in recovering deleted DCIM folder Samsung Galaxy in three simple steps. It is also helpful for users who find Samsung Galaxy S7 DCIM folder empty. Before beginning the recover DCIM folder process, switch the Samsung Galaxy device into developer mode and connect to a system using a USB cable. 1. Launch the Samsung Galaxy DCIM folder recovery program by clicking the icon from the desktop. By default, the software enables all the available file formats for retrieval. However, as DCIM is for images, users can disable all other file formats except "Pictures". Press the "Start" button to proceed to the next step. 2. In the next screen, iBeesoft will display all the partitions that are available on the computer along with any external devices connected. Users have to select the connected Samsung Galaxy device and press the "Scan" button to recover deleted DCIM folder in Samsung Galaxy. 3. The application will begin scanning the Samsung Galaxy device. Upon completion, the program will compile all the retrieved data under a single folder (in this case, "Pictures"). The left column of the window displays the tree directory for quick maneuvering across the recovered folders. The center column of the window displays the files present in the selected folder. 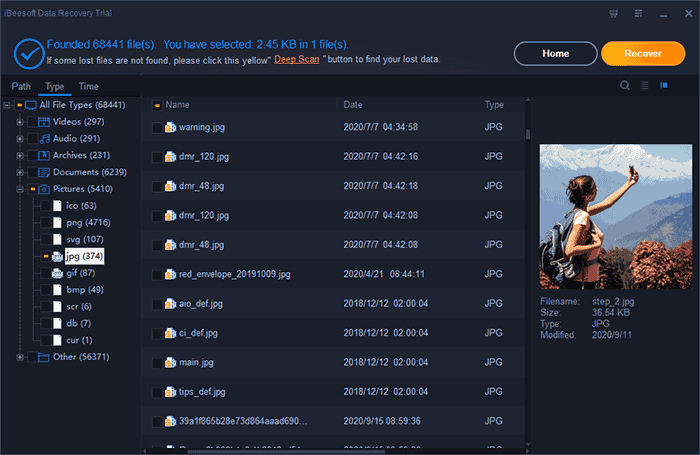 Users can see the files by clicking the appropriate folder from the tree directory. In this case, it is the "Pictures" folder. The last column of the window shows the thumbnail of the selected images from the "Pictures" folder along with information of the image. 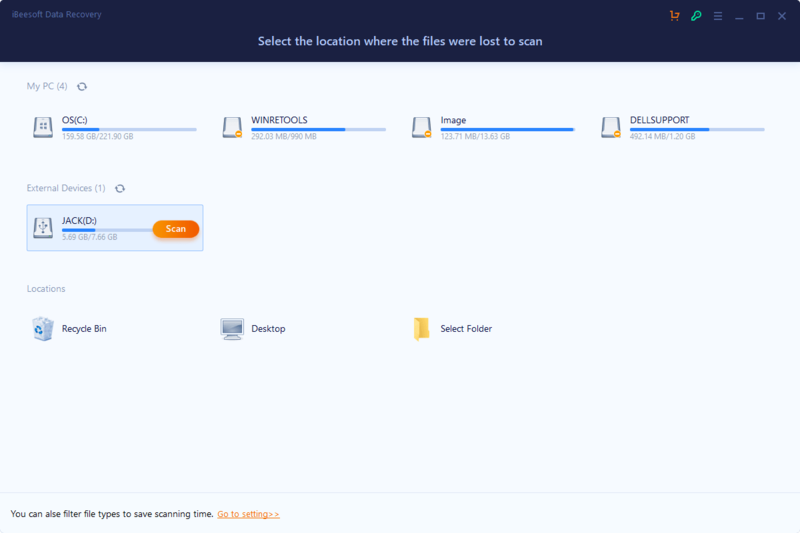 Users can select important files or the entire folder and press the "Recover" button to save them to a folder on the computer. Note: If the normal scan failed to retrieve a few of the images, users could choose the "Deep Scan" option. The technology scans the device thoroughly and is a time taking procedure. It will display the results after completion of the scan and users can recover files according to the requirement.